The Logical Way Around Your Spacial Restrictions with Racking. Here at Storage Concepts, we have had a variety of different clients. Some who are based in the warehousing industry. Working with the client we are able to design and install bespoke racking to suit their needs. Creating unique systems to the individual needs of the company allows us to renovate warehouse space. Regardless of the size of the space we can work with you to make a much bigger and better area for your company. Allowing you to bring in more stock or use the space for other purposes. When speaking to clients about the current situation at their warehouse. The immediate perception is that of the many companies is their current location is too small and so it’s time to relocate. However, this is a very expensive and often unnecessary solution. All companies struggle for space at times. Whether it’s in an office or a warehouse and fortunately for those in the distribution sector. 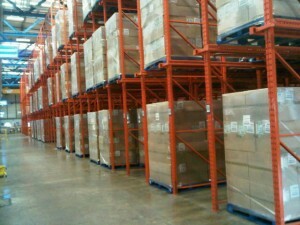 Warehouse racking systems are able to come to the rescue. By being suitable for use with forklifts, the bespoke creations can utilise the space overhead rather than just using the floor space, which may be the current situation. The majority of warehouses have high ceilings, which leaves over head room free and unused. This is where we can help. Our design team we are able to come in and make the most of the over-head unused space to give you a whole new area of the building to use. This means you can bring in more stock to sell on. Making it a very cost-effective solution to your storage problems, leaving you wondering how you managed to cope before. Accommodating any pallet size or weight, the racking systems on offer from Storage Concepts aren’t limited in their availability either. Many firms think their goods are too heavy to store off the ground and try and work around the obstacles. Which looks untidy and is also quite dangerous in some circumstances. Our designers are able to come in and evaluate the sort of warehouse racking system needed, taking on the challenge and producing a fine end product that meets the specifications. To find out how a racking system from Storage Concepts can help your business, get in touch today by filling in our online contact form or calling 01664 410414.